The following is the list of official public holidays recognized by the Government of Russia. On these days, government offices, embassies and some shops, are closed. If the date of observance falls on a weekend, the following Monday will be a day off in lieu of the holiday. In addition to New Year's Day (Новый год Novy god) on 1 January, 2–5 January are public holidays as well, called New Year holiday (Новогодние каникулы Novogodniye kanikuly). The holiday includes January 6 and 8, with Christmas being January 7, declared as non-working days by law. Until 2005, only 1 and 2 January were public holidays. Christmas in Russia (Рождество Христово Rozhdestvo Khristovo) is celebrated, on 25th December Julian calendar which falls on January 7th Gregorian calendar and commemorates the birth of Jesus Christ. The public holiday was re-established in 1991, following the decades of suppression of religion and state atheism of the Soviet Union. The Defender of the Fatherland Day (День защитника Отечества Den zashchitnika Otechestva) is celebrated on 23 February and is dedicated to veterans and members of the Armed Forces of the Russian Federation, though it is often colloquially known as Men's Day (День Мужчин, Den' Muzhchin) and commonly treated as a celebration of all men. The holiday was established in 1918. On the eve of World War I campaigning for peace, Russian women observed their first International Women's Day on the last Sunday in February 1913. In 1913 following discussions, International Women's Day was transferred to 8 March and has remained the global date for International Women's Day ever since. In the former Soviet Union, 1 May was International Workers' Day and was celebrated with huge parades in cities like Moscow. Though the celebrations are low-key nowadays, several groups march on that day to protest grievances the workers have. May 9, Russia celebrates the victory over Nazi Germany, while remembering those who died in order to achieve it. On 9 May 1945 (by Moscow time) the German military surrendered to the Soviet Union and the Allies of World War II in Berlin (Karlshorst). Victory Day (День Победы Den Pobedy) is by far one of the biggest Russian holidays. It commemorates those who died in World War II and pays tribute to survivors and veterans. Flowers and wreaths are laid on wartime graves and special parties and concerts are organized for veterans. In the evening there is a firework display. A huge ground and air military parade, hosted by the President of the Russian Federation, is annually organized in Moscow on Red Square. 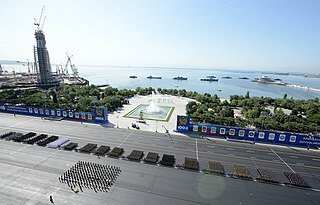 Similar ground, air and marine (if it is possible) parades are organized in several other Russian cities (which are Hero Cities or have military district or fleet headquarters primarily). Russia Day (День России Den Rossii) is the national day, celebrated on June 12. On this day, in 1991, Russian parliament formally declared Russian sovereignty from the Soviet Union. The holiday was officially established in 1992. Initially it was named Day of the Adoption of the Declaration of Sovereignty of the Russian Federation, on 1 February 2002 it was officially renamed to Russia Day (in 1998 Boris Yeltsin offered this name socially). In Russian society there is a misconception that this holiday is also called "Russia's Independence Day", but it never has had such a name in official documents. According to a survey by Levada Center in May 2009, 44% of respondents named the holiday as "Independence Day of Russia". Unity Day (День народного единства Den narodnogo edinstva) was first celebrated on November 4, 2005, commemorates the popular uprising led by Kuzma Minin and Dmitry Pozharsky which ejected the Polish invaders from Moscow in November 1612, and more generally the end of the Time of Troubles and foreign intervention in Russia. The event was marked by a public holiday which was held in Russia on October 22 (Old Style) from 1649 till 1917. Its name alludes to the idea that all the classes of Russian society willingly united to preserve Russian statehood when its demise seemed inevitable, even though there was neither Tsar nor Patriarch to guide them. Most observers view this as an attempted replacement to counter Communist demonstrations on November 7 holiday, which marked the anniversary of the October Revolution. National Unity Day is also known as Consolidation Day (as an alternative translation), which people in Russia celebrate on November 3–4. ^ "RF State Duma to vote establishment of Day of Russian Parliamentarism on Friday". Itar Tass. Retrieved 22 April 2013. ^ "Russian State Duma calls for efforts to popularize Russian language abroad". Itar Tass. Retrieved 6 May 2013. Victory in Europe Day, generally known as VE Day or V-E Day, was celebrated on Tuesday, 8 May 1945 to mark the formal acceptance by the Allies of World War II of Nazi Germany's unconditional surrender of its armed forces. The formal surrender of the German forces occupying the Channel Islands did not occur until the following day, 9 May 1945. It thus marked the end of World War II in Europe. Russia Day called Day of adoption of the declaration of state sovereignty of RSFSR before 2002, is the national holiday of the Russian Federation. It has been celebrated annually on June 12 since 1992. It commemorates the adoption of the Declaration of State Sovereignty of the Russian Soviet Federative Socialist Republic (RSFSR) on June 12, 1990. The passage of this Declaration by the First Congress of People's Deputies marked the beginning of constitutional reform in the Russian Soviet state. Victory Day is a holiday that commemorates the surrender of Nazis in 1945. It was first inaugurated in the 15 republics of the Soviet Union, following the signing of the German Instrument of Surrender late in the evening on 8 May 1945. The Soviet government announced the victory early on 9 May after the signing ceremony in Berlin. Though the official inauguration occurred in 1945 the holiday became a non-labour day only in 1965 and only in certain Soviet republics. Many nations around the world observe some kind of Armed Forces Day to honor their military forces. It is celebrated in the United States as a day to appreciate all active duty service members. This day is not to be confused with Veterans Day or Memorial Day. Saint George's Day, also known as the Feast of Saint George, is the feast day of Saint George as celebrated by various Christian Churches and by the several nations, kingdoms, countries, and cities of which Saint George is the patron saint including England, and regions of Portugal and Spain. Saint George's Day is a Slavic religious holiday, the feast of Saint George celebrated on 23 April by the Julian calendar. In Croatia and Slovenia, the Roman Catholic version of St. George's day, Jurjevo is celebrated on 23 April by the Gregorian calendar. The Intercession of the Theotokos or the Protection of Our Most Holy Lady Theotokos and Ever-Virgin Mary, is a feast of the Mother of God celebrated in the Eastern Orthodox and Byzantine Catholic Churches. The feast celebrates the protection afforded the faithful through the intercessions of the Theotokos. In the Slavic Orthodox Churches it is celebrated as the most important solemnity besides the Twelve Great Feasts and Pascha. The feast is commemorated in Eastern Orthodoxy as a whole, but by no means as fervently as it is in Russia, Belarus and Ukraine. It is not a part of the ritual traditions of, and therefore is not celebrated by, the Oriental Orthodox Churches or Western Rite Orthodoxy. Yet the feast is perfectly consistent with the theology of these sister churches. It is celebrated on October 14. Defender of the Fatherland Day ; Kazakh: Отан қорғаушы күні; Tajik: Рӯзи Дорандаи Ватан; Kyrgyz: Мекенди коргоочулардын күнү; Belarusian: Дзень абаронцы Айчыны) is a holiday observed in Russia, Turkmenistan, Belarus, Kyrgyzstan, Kazakhstan and Tajikistan. It is celebrated on 23 February, except in Kazakhstan, where it is celebrated on 7 May. Tushino airfield is a former general aviation airfield located in Tushino, northwest Moscow, Russia. During the Cold War, this was the site of military exercises showcasing the latest in Soviet innovation. These exercises were held on Soviet Air Fleet Day. Russia–Rwanda relations refers to the bilateral relationship between the two countries, Russia and Rwanda. Independence Day is an official national holiday in Uzbekistan, celebrated on the first of September. fireworks, concerts, competitions, military parades, and wreath laying ceremonies are held in Tashkent during the independence day celebrations. Victory Day over Nazism in World War II or Victory Day is a national holiday and a day off in Ukraine. It was first celebrated on 9 May 2015 and follows the Day of Remembrance and Reconciliation on May 8. The holiday replaced the Soviet "Victory Day", which was celebrated in the post-Soviet Union states, including Ukraine, until 2014 inclusive. The Special Operations Forces of Russia, or SOF are strategic-level special forces under the Special Operations Forces Command of the General Staff of the Armed Forces of the Russian Federation. Day of the Russian Navy is national holiday in the Russian federation. The day honors the members of units of the Russian Navy. It is celebrated annually, on the last Sunday of July. Day of the Holiday of the Ukrainian Navy is holiday in Ukraine. The holiday celebrates the founding of the Ukrainian Navy. Moscow City Day is an official event in Moscow that honors the city's founding. Moscow traditionally celebrates during the first weekend in September. The celebration involves free cultural events, a parade and evening fireworks. Border Guards Day, also known as Frontier Guards Day is a former Soviet holiday that celebrates the Border guard services of Russia and former Soviet republics. It is currently observed in Russia, Belarus, Kyrgyzstan, Tajikistan, Kazakhstan and Moldova on 28 May - the day of the anniversary of the formation of the Soviet Border Troops in 1918.